Let me start by saying that I really love Dropbox. When I first saw the working beta video of Dropbox it was a rare moment in technology, where I was grinning from ear to ear, eager to get my hands on it, amazed at the simplicity and speed. Since signing up I have never had a problem with Dropbox. It’s been a fantastic tool, and an even better service, which many developers have built great apps on. I mean every word of that statement but I didn’t want to do it. 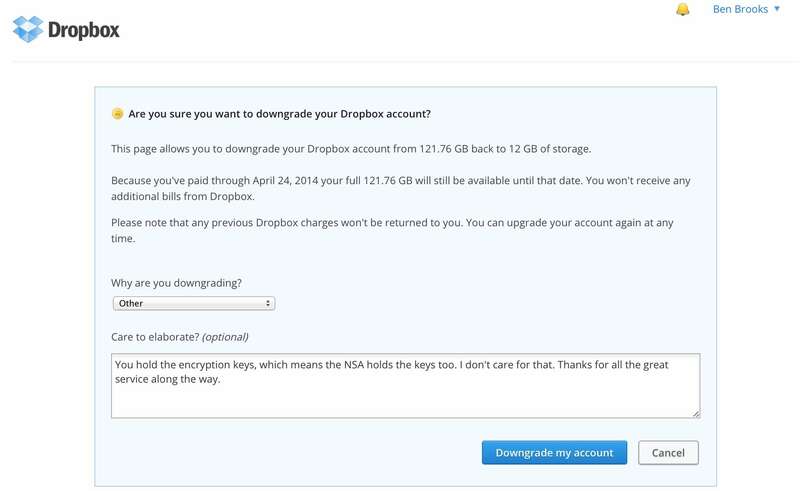 I wanted Dropbox to revise their system and make it less susceptible to snooping by the NSA, but they haven’t. There are many, many, alternatives out there and I haven’t settled on just one. Instead I’m spreading out and doing the nerdy-masochistic method of using a lot of different services. I’ll still keep Dropbox around, but instead of keeping 50GBs in the folder, there’s just 12MBs now — mostly old B&B Podcast stuff, and syncing files for a few apps. Some of the alternatives I’m currently using are: BitTorrent Sync, ownCloud, and File Transporter. Let’s take a brief look at my experiences with each. It seemed like the moment I started posting about the NSA scandal, readers began emailing me to ask about BitTorrent Sync. The first thing to know is that BitTorrent Sync is very much not Dropbox. Meaning there is no central server in the cloud where your files are stored. Files are synced from computer-to-computer. Any folder on your computer can be synced. Each folder has its own encryption key and must be added individually to a new computer or device. Unlike Dropbox, you can’t login to BitTorrent Sync on another computer and see all of your synced folders. Each folder can be shared with full privileges, or shared with read-only privileges. That’s the basics of BitTorrent Sync, which is a far more complex, yet more secure, offering than Dropbox. Since there’s no central server there are no size limits on storage — you can sync whatever your devices can store. Right now I use BitTorrent Sync for two folders on my Mac to my Mac mini server: My Photos folder, which creates a nice backup for my ever changing Lightroom library and any other photos in that folder. I also sync what I call my “Working” folder, which is the folder where I keep all active documents on my Mac. Essentially, BitTorrent Sync provides a real-time backup of my two most essential folders. Together these folders weigh-in at between 5-15GBs (depending on when I last cleared out my Lightroom Library). The iOS app is fairly new to me but seems to work well. There’s a few great features like mobile-to-mobile sharing and more standard features like automatically backing up the Camera Roll. Since the private keys are very long, BitTorrent Sync makes connecting your iPhone a bit easier with (probably) the best use of QR codes I have ever seen. I can’t comment too much on the stability of the app, since I have only ever used it with iOS 7 Beta and can’t be sure which bugs are in iOS 7 and which are in the app. The app works much like the Dropbox equivalent, showing the shared folders, file names and types. Tapping a file downloads it (presumably one of your devices must be online for this to work). The mobile-to-mobile sharing is located in its own tab, and you can choose to either send files or wait to receive them. This is an active process (you need to initiate it) and not something that could happen in the background because you have to actually scan the QR code on the other device. A passcode to restrict access to the app would be ideal, but it currently doesn’t have one. BitTorrent Sync is fast, and very secure. It’s the security that will make it annoying for most users — that and the lack of a central server. In order to use this as a full Dropbox replacement you need to have at least two computers and a reasonable expectation that one of those computers will always be on and connected to the web. Sadly, I couldn’t find many (any?) apps that use it as a backbone the way apps use Dropbox. As usual, I’m concerned about the service/platform being free, because I can’t pay to support its ongoing development. The second thing I installed on my Mac mini server was an instance of ownCloud, by following these great instructions. This is an entirely self-hosted solution, so you really need your own web server to make use of this tool. However, once its running, ownCloud is a full Dropbox replacement, and much more. In addition to files, ownCloud can share, host, and manage contacts and calendars (among other things). For the purpose of this post I am just looking at files. It is by far the closest (and a better) solution for teams and businesses that have their own web server. Individuals benefit from increased privacy over Dropbox, but there seems to be a much better set of features for companies using the paid enterprise version. Like Dropbox your files are hosted on a server, but unlike Dropbox you can choose to control that server yourself. The files are not stored on the server in an encrypted manner (as far as I can tell). You should encrypt the drive yourself. There is an option to transmit all data to and from the server over HTTPS, which I recommend. Currently I only use ownCloud for my text notes. Like BitTorrent Sync, the only iOS app that I could find to support ownCloud is the official app, which is decent but not amazing. The app offers a passcode lock, which is always nice to have. I like the idea of ownCloud a lot, but the lack of support by third-party apps makes it a tough sell. It’s not as strong as BitTorrent Sync, and even a bit less secure given that usernames and passwords are used instead of keys. Like Dropbox you must store everything under the ownCloud folder, which is inflexibility I have grown to dislike. I’ve already given an overview of the File Transporter, but the synopsis is this: it’s basically Dropbox in a little mini-server. You can set it up at your house, or have it professionally hosted. I like the idea a lot, and the version 2.0 beta software is really advancing the system but there are downsides. The File Transporter is a software driven device, and the software really isn’t that good. It basically works fine but its design is pretty lackluster and currently it’s a long way from a “just works” solution. Access speed for files hosted on the Transporter largely depends on the Internet connection where you host the device. I have mine hosted by Macminicolo.net and it’s pretty fast, but there’s a noticeable lag when requesting a file listing, which can be annoying. When I had the device at home it was rock solid, but not nearly as fast to access files once I left the house. The Transporter is my basic “archive of crap”. It’s everything that I want to keep around, but don’t want to keep on my Mac. It’s the stuff I might need, so I save it just in case. The File Transporter is a solid solution, and as the platform and software matures I suspect we’ll see wider adoption. From what I can tell (info is scarce), the files do not appear to be encrypted on the device. So while the transfer of files is encrypted, the files are, yet again, stored unencrypted. This is a major bummer if you have your device hosted in a location you don’t control physical access to. With the other options you can configure the storage you are using to be encrypted, but with the Transporter there is no such option. My fear with keeping the Transporter at home was: a burglar could get all the files if they jacked it — this is only slightly lessened in a hosting facility. I hope Connected Desktop addresses this, but have no word if they will. So now what? I’ve outlined three options, but there are others out there. You should investigate services like Bitcasa and SpiderOak, seems to be the most secure, Dropbox-like, offering requiring no special hardware. If you already have a web server, or a computer that is always on, I think BitTorrent Sync is the best option. It forgoes almost every convenience for the sake of being the most security conscious of the non-server options. Simply using whole-disk encryption should solve your woes with file privacy between two computers when you use BitTorrent Sync. The biggest problem with moving away from Dropbox, isn’t finding more secure alternatives, it’s that no other offerings have a third-party developer ecosystem like Dropbox. You can’t run a search in the App Store without finding something that syncs with Dropbox, which is great, but there are few (if any) third-party apps working with the Dropbox alternatives I have listed here. Ultimately, the only reason to leave Dropbox is if you don’t like the idea that Dropbox employees and the government could gain access to your files. If that is impetus enough for you to leave, then SpiderOak or BitTorrent Sync is what I recommend. If that isn’t enough for you to leave, then Dropbox is by far (truly leaps and bounds “by far”) the best option.